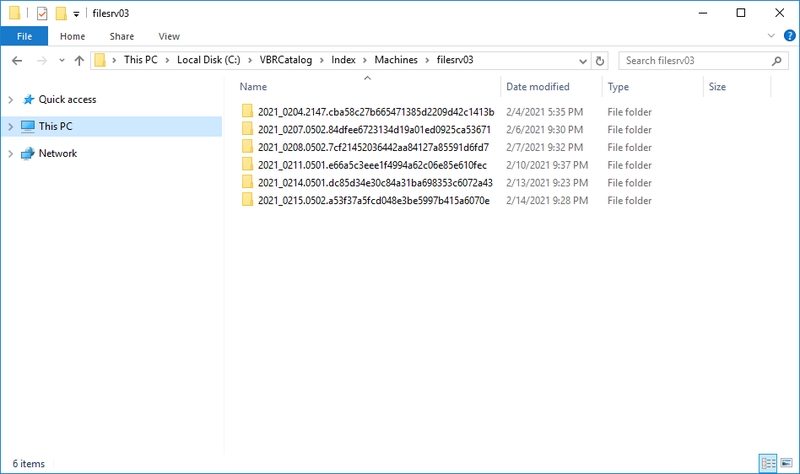 Veeam Backup & Replication stores indexing data in the Veeam Backup Catalog folder. By default, the Veeam Backup Catalog is located in the C:\VBRCatalog folder on the Veeam backup server and on Veeam Backup Enterprise Manager. Machine index reproduces the structure of files and folders on the machine guest OS. Veeam Backup & Replication uses the file index to search for guest OS files within machine backups. For every machine whose file system has been indexed, there is a dedicated folder that contains indexing data for all restore points available for the machine. Veeam Backup Catalog keeps information for every backup job session. Session indexing data describes which machine restore points correspond with a specific backup job session and what sets of files are required to restore a machine to a specific point in time. For incremental backup chains, a session indexing file contains information about only one restore point — the restore point that is created with this backup job session. Additionally, it contains information about a set of files that is required to restore a machine to this point in time. For example, if a backup chain contains 5 restore points, the 5th session indexing file will contain information about the 5th restore point and a group of 5 files that are required to restore the machine to this point in time. For reverse incremental backup chains, a session indexing file contains information about all restore points engaged in the backup job session. In a reverse incremental chain, the last restore point is always a full backup. To produce a full backup and calculate incremental changes, Veeam Backup & Replication needs to address all points in the job. For this reason, the session indexing file refers not only to the restore point created with the backup job session, but also to all restore points preceding it. Additionally, a session indexing file describes groups of files that are required to restore a machine to all possible restore points. 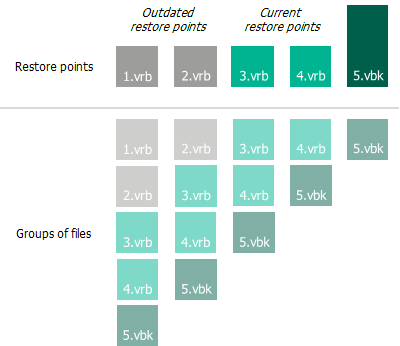 For every restore point, there is a separate group of files. Group 0 will list restore points that are required to restore the machine to the 1st, the earliest restore point. Group 1 will list restore points that are required to restore the machine to the 2nd restore point. Group 2 will list restore points that are required to restore the machine to the 3rd, the latest restore point. A full backup file “moves forward” with every new backup job run, and Veeam Backup & Replication updates groups of files, correspondingly. This helps maintain valid groups of files required to restore a machine to a necessary point in time. The session indexing files maintain groups of files for all restore points that have ever existed in the backup chain. This behavior lets you search and restore machine guest OS files in archived backups. When a backup is archived to tape or to a secondary backup repository, you can still browse the machine file system to this point in time using historical indexing data. Once you find a necessary file, Veeam Backup Enterprise Manager uses the session indexing file to inform you what group of files is required to restore the machine to the selected point in time.